We continue to be amazed by the way in which food photographer, Jules Douglass captures the pure essence of food, and making it look mouth wateringly delicious. She continuously emphasizes organic, well sourced ingredients, and it is no wonder she was able to make Best Food’s new Organic Mayonnaise shine in this post. These steak salad cups are as delicious as they are beautiful. Easy to assemble (as seen in the method section! ), these are perfect for no fuss summer entertaining and sure to be a crowd pleaser at your next gathering. This recipe calls for the Organic Original Mayonnaise, but you could have equally impressive results with the Organic Spicy Chipotle and Organic Roasted Garlic! Note: When grilling steak ­ always make an extra steak to ensure there are leftovers ­ which can be turned into this tasty, light lunch the following day. Add all ingredients in a high powered blender. Start on low and turn to medium speed, about 20­-30 seconds. Give it a stir and pulse until well blended and creamy smooth. Season to taste. If dressing is too thick, thin with either lime juice or warm water. 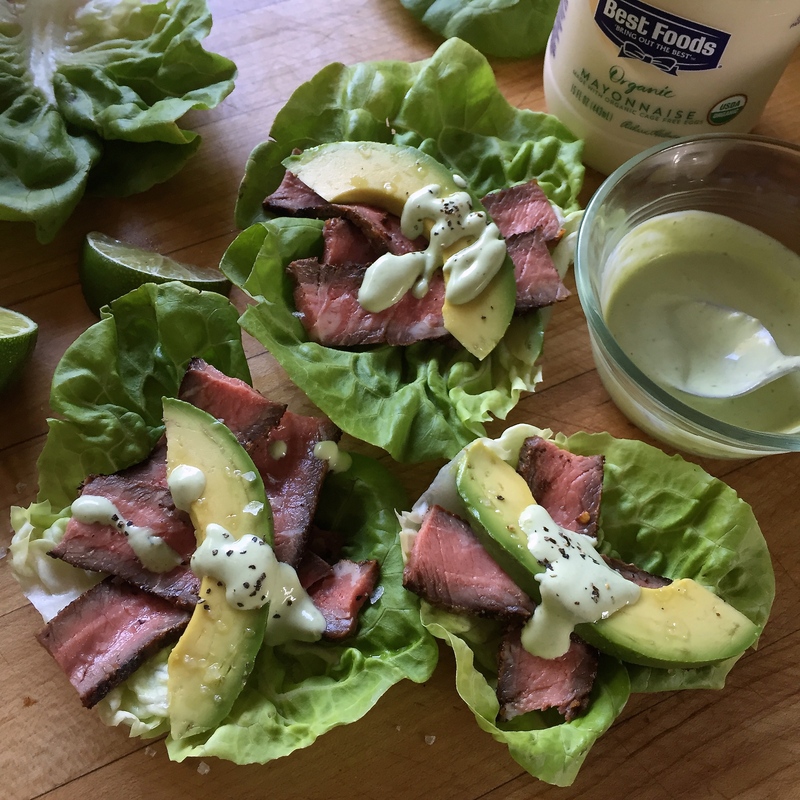 Stack beef and avocado in lettuce cups and drizzle with dressing! Eat immediately.